Hanky Tank, Virtual chromatic percussion from Boscomac. Boscomac adds to its Reaktor add-in arsenal the Hanky Tank percussive module. Hanky Tank is a 4-octave percussive instrument based on a propane tank and which sound is similar to that of a Hang Drum. The module offers various tone, tuning, harmonics, dissonance controls, as well as a reverb and an arpeggiator. 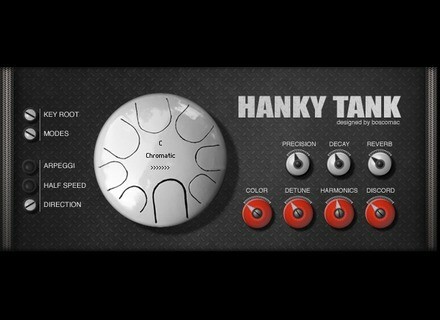 You can listen to audio demos and download Hanky Tank from boscomac.free.fr. Its a donationware. AmpliTube Fender compatible with Audiobus IK Multimedia has updated the Fender edition of its AmpliTube iOS app to version 1.5.